The Community Foundation of the New River Valley (CFNRV) was honored this week as one of only ten nationwide recipients of the 2016 HUD Secretary’s Award for Public Philanthropic-Partnerships. Cosponsored by the U.S. Department of Housing and Urban Development (HUD) and the Council on Foundations, the award recognizes foundations for their efforts to improve communities through a partnership with local, state, and federal governments. The CFNRV was specifically recognized for its role in the NRV Aging in Place Leadership Team, a collaborative of public and nonprofit partners working to ensure that NRV residents can age safely and independently in their homes and communities. The award was presented at the Council on Foundation’s Annual Meeting in Washington D.C. The Aging in Place Leadership Team emerged from the NRV Livability Initiative, a three-year planning process that developed a shared vision for the region’s future. Among the plan’s most significant findings were impending demographic changes. By 2030, the population of NRV residents ages 65 and older will double, while in rural areas the population under 25 will decline. To address this challenge, the CFNRV joined with regional partners to form the Aging in Place Leadership Team which began by holding two regional workshops to assess the needs of older adults. They used the findings to develop the Aging in Place Action Plan, which offers six specific strategies to support the region’s aging population. The Team has now turned to implementing the plan. In 2015, members launched the Lifespan Friendly Homes Program, which provides home modifications for low-income adults such as building ramps, adding grab bars, and developing strategies to save on energy costs. In 2016, the Team provided leadership for the Old Prices Fork School Community Revitalization Project offering affordable and accessible housing for older adults and serving as a local foods hub with a community kitchen and farm-to-table restaurant. They have now turned their energy toward creating a regional TimeBank, a system of giving and receiving volunteer time with particular emphasis on assisting older adults. Throughout the Aging in Place team’s work, the CFNRV has played a critical role in convening partners, facilitating conversation, and accessing both local and national funding. In addition, Aging in Place is one of four key focus areas for the CFNRV’s new Fund for the NRV, focused on encouraging regional collaboration to find long-term solutions to the NRV’s greatest challenges. “The CFNRV has been honored to be a part of the Aging in Place Leadership Team. 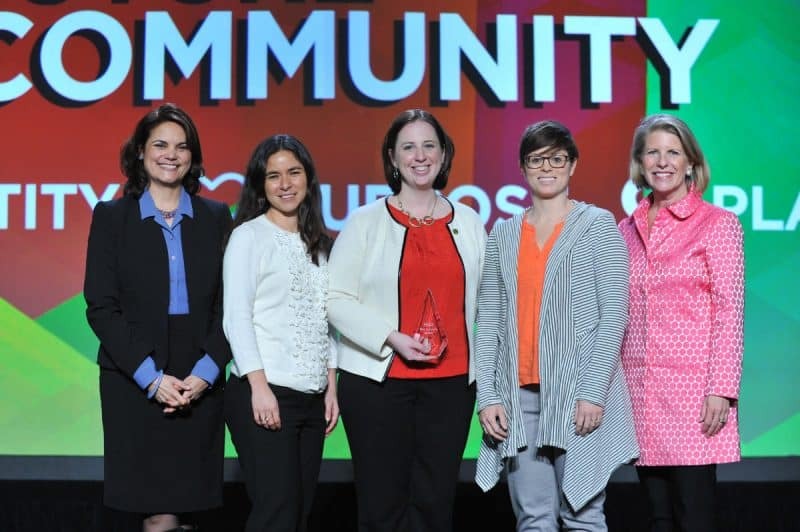 Although the HUD Secretary’s Award recognizes the work of our foundation, our accomplishments are the result of many organizations working in partnership. We’re grateful to the NRV Agency on Aging, the NRV HOME Consortium, the NRV Regional Commission, Habitat for Humanity, the Town of Blacksburg, Montgomery County, Community Housing Partners, the NRV Health District, Taylor Hollow Construction, Virginia Community Capital, the Virginia Tech Center for Gerontology, and the Virginia Department for Aging and Rehabilitative Services for their incredible dedication to this partnership,” said Jessica Wirgau, executive director of the CFNRV. The CFNRV is continuing to raise money to devote to the NRV TimeBank and other Aging in Place Initiatives. Those interested in supporting these projects can visit cfnrv.givebig.org and make a gift to Aging in Place through The Fund for the NRV. For more information on the Aging in Place Leadership Team, contact Kim Thurlow at kimthurlow@cfnrv.org or at 540-381-8999.